Planning a Florida getaway at Christmas 2020? Book your December 2020 Orlando flights now. We have advance rates on the major airlines, including BA, Virgin, Norwegian and United. Call us on 01934 319 851 or complete our online enquiry form for more information. Florida is a popular destination at Christmas time and flights are busy. Careful planning helps save money on December 2020 Florida flights. Can you depart before December 10th 2020? Seats are cheap for these dates. Even direct flights are excellent value. Planning to leave between 10th-13th December 2020? Fares are still decent value. 14th – 24th December 2020 is high season. For best value, choose an indirect flight. Prices drop between 25th – 27th December 2020. Low season starts on 28th December 2020. Even the fares on direct flights are excellent value. Depart on a Tuesday or Wednesday for the cheapest fares (weekend fares incur a supplement). On peak dates, fly indirect. The journey time is only a few hours longer, but savings are significant. Heathrow has the most departures to Florida – a mid-week departure is great-value, even on peak dates. Glasgow, Edinburgh and Manchester also have indirect flights at a good-value fare. Most tourists choose to arrive at Orlando International. Its location in the heart of Florida is ideal for families on a Disney holiday. If you’re staying further afield, flying to Miami, Tampa or Fort Myers may be more convenient. Prices during peak season can often be better value than Orlando International. Let us know if this is an option for you. Indirect flights from Heathrow are very economical, even on peak dates. Not quite as much service from Manchester, but flights with one stop in Atlanta or Newark are still very good value. Scotland is well served – plenty of flights from both Glasgow and Edinburgh. If you’d rather fly from your local airport, let us know – we book connecting flights for a supplement. Exeter, Newquay, Jersey, Isle of Man, Aberdeen, Inverness and Belfast all have convenient schedules. Your luggage is checked directly through to Florida. We achieve excellent value on Florida flights without compromising on quality. We book with major airlines, including United, Virgin, BA and Norwegian. Our technique is simple; we monitor flight prices daily and use our judgement to purchase seats at the best price. Advance book your December 2020 Florida flights now to take advantage. How much do you expect to pay for your December 2020 Orlando flights? High Street prices exceeding £1000 are common. Follow our advice and advance book for considerable savings. You could achieve fares as low as £395 per adult and £325 per child, even spending Christmas Day 2020 or New Year’s Eve 2020 in Florida. It’s not too early to book your December 2020 Florida flights. Advance book now at an excellent price. Combine your flight with car hire for a great-value Florida fly-drive. Or book the complete holiday package – we book the popular resorts, villas and hotels. We can even save you money on attraction tickets. All our December 2020 Orlando flights and holidays are ATOL and ABTA protected. Book now with a deposit of £100 per person. Balances are due 90 days before departure, giving you plenty of time to budget. For more information, call us on 01934 319 851 or complete our online enquiry form for an email quote. Escape the miserable UK winter and enjoy the Orlando sunshine with our cheap December 2020 Florida holiday. Flights, car hire and accommodation are all included. Prices start at just £765 per person. 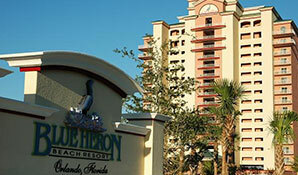 Stay for two weeks at the Blue Heron Beach Resort, Lake Buena Vista. The location is ideal for families looking to visit Disney World and Universal Studios. Shops, restaurants and entertainment are all close by. Advance book now with a deposit of £100 per person. ATOL and ABTA protected.